I'm a fan of personalized items. You might be surprised to know when I was a kid, it was actually difficult to find items with JULIA written on them. There was always a JuliE, which was NOT my name. In fact, one time, my mom bought a "This is Julie's Room" sign and scratched out the E and replaced it with an A. Good ol' moms. Nowadays, it's much easier to find personalized items -- toothbrushes, chairs, CDs, pens -- you name it, you can get your kid's name on it. I'm known for buying my friends' babies a personalized blanket when they're born - I think it's a keepsake they'll love and treasure, and it's useful. 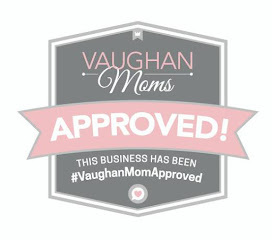 I'm also a fan of local companies, and local moms. Everyday Grace is one of them. 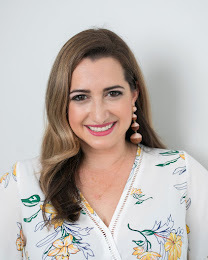 The lovely Lindsay Brewda is the mom behind Everyday Grace (formerly Grace Announcements), the company she started after having her first child. Everyday Grace creates the most beautiful invitations, birth announcements, holiday cards. They are custom created and super affordable, too. And they're right in York Region. 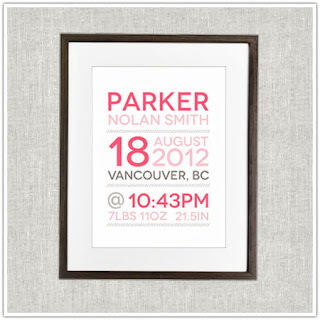 I especially love Everyday Grace's Personalized Wall Art Prints. They are custom-designed and the paper is a thick, acid-free archival stock. 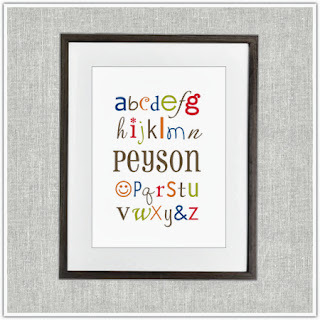 My daughter's room has the alphabet on a large wall - wouldn't this be a great compliment? The Stats collection is a simple, but elegant reminder of all those important numbers in the first few moments of your child's life. Various colours are available as well, to complement your child's nursery or decor. 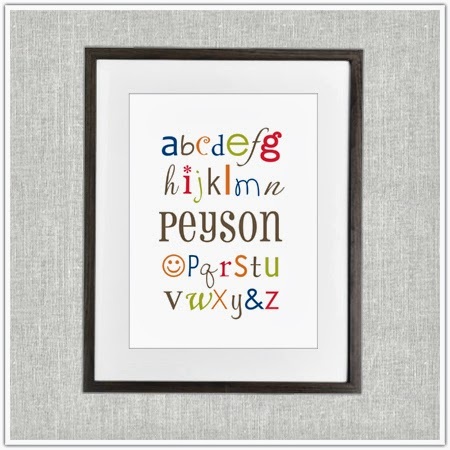 Wouldn't you love to have one of these Personalized Wall Art Prints in your child's room? Now's your chance! Fill out the Rafflecopter below to win - and thanks to Everyday Grace for this generous offer! Disclosure: I received a Wall Art Print from Everyday Grace. 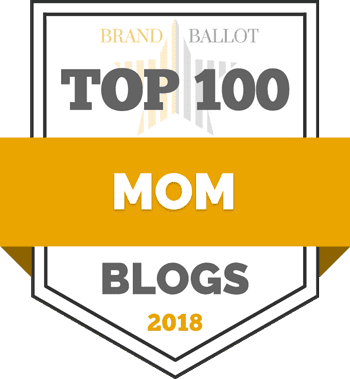 The opinions expressed on my blog remain my own. okay this hasn't been easy to enter. the facebook links on the rafflecopter weren't working. searching for everyday grace sent me to a lot of religious pages. but I final did a web search and found them on pinterest which I followed and look forward to looking through their boards. I love the personal stats all framed up and pretty looking. I was planning on tring to do it myself for my sister and cousin both due in the next couple weeks but i'm not that good with the computer. so i'd probably order it if I won. Oh my goodness! Thanks for letting me know! I'll look into it right away!! I found simply suppa but not everyday grace. I said I liked them because I would if the links were there. 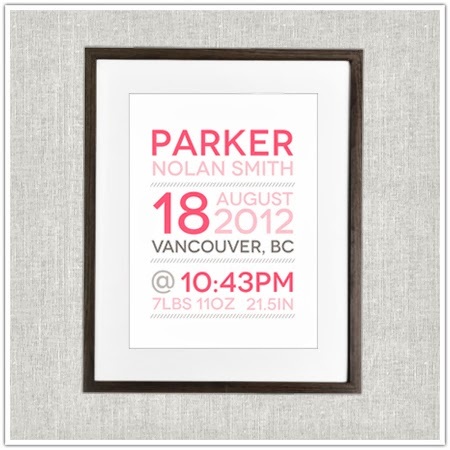 I would love one of these with my baby's name and all his birth info. I love them. Ok everyone! It should work now!